A round-table discussion “The real face of Aleksandr Solzhenitsyn” took place in the University of Bordeaux as part of a Marxist conference, a correspondent of the Rossa Primavera News Agency reported on December 10. 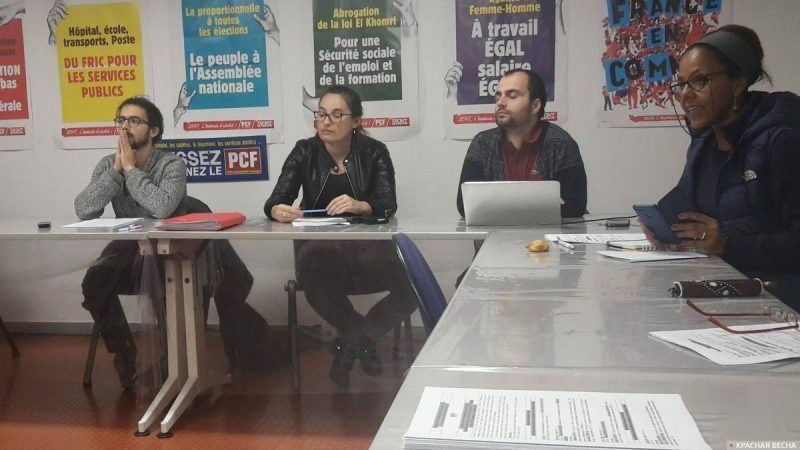 A conference of left-wing intellectuals “Marxist Platform” takes place in late November to early December every year in Bordeaux. The conference is focused on society’s current issues and challenges and related historical, economic, anthropological, and other aspects. This year, one of the conference sessions discussed the person of Aleksandr Solzhenitsyn, his role in the disintegration of the USSR and the West’s attack against Russia. A member of the Essence of Time movement delivered a report at the session. In his presentation, the presenter spoke about the facts of Solzhenitsyn’s biography, elucidating both personal qualities of the author of The Gulag Archipelago and his motivation in writing his fiction books and political texts. “Solzhenitsyn’s behavior during the war, evidence provided by the writer’s family members whom he subjected to abuse with his frontline correspondence, different versions of his own autobiography delivered by Solzhenitsyn to suit his Western patrons, the very works of the author of The Gulag Archipelago, they all destroy his image as a person who ‘lives not by lies’,” the Essence of Time member said. “Solzhenitsyn’s hatred towards fascism was not as desperate as his hatred towards his own country,” the speaker continued, “Solzhenitsyn defended collaborationists; he saw no difference between the Soviet authorities and the fascist regime, and he believed that the Soviet authorities were even worse.” At this moment, the audience grumbled in disagreement. A lively discussion after the report began with a question “should a writer be judged only by his works, but not by his biography?” In his answer the speaker recalled that the Russian authorities promoted Solzhenitsyn as a person of exceptional moral qualities, an unyielding fighter against the Soviet system, and a moral guide for young people. Is this really the case? The focus of the discussion quickly switched to Solzhenitsyn’s interpretation of Stalin’s repressions: the reasons that caused the repressions and the actual numbers of those repressed. The participants of the round-table discussion noted that the numbers circulating in France were overestimated several-fold. Many in the audience spoke of the importance of a public discussion of topics related to the actual history of the USSR. According to Doctor of Historical Sciences Zemskov, the number of those repressed for anti-Soviet activity in the USSR from 1921 to 1954 was 3,777,380 people, of which 799,455 were sentenced to death. These numbers obtained through work in the archives. Solzhenitsyn, who was not a historian, overestimated the number of victims of repressions by dozens-fold. On the eve of Solzhenitsyn’s anniversary, a number of pickets against the falsification of history are taking place in France, demanding to restore the historical truth. Irreversible changes are taking pace worldwide: social achievements, education, science, and development are being eliminated. Those who are doing this need to permanently stigmatize the successful experience of building a socialist state, the Soviet experience, and to put an end to the Russian civilization as an added bonus. This is where Solzhenitsyn can be most helpful. Once his lies were employed to destroy our country. The fact that Solzhenitsyn’s name is put on the banners again as a moral authority suggests worrisome trends that a perestroika 2.0 has begun. Because a state cannot be preserved through historical lies. This entry was posted in News from the West and tagged France, Solzhenitsyn, War Against History. Bookmark the permalink.